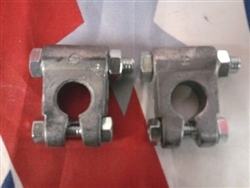 This is a set, 1 positive and 1 negative heavy duty battery terminals for M-series vehicles. We also sell these as a set of 4. 2 positive and 2 negative terminals. Copyright © Real Custom Trucks. All Rights Reserved.